Attack on Titan has remained gripping, brutal, and masterfully woven in episodes 5 through 7. It spotlights deep-running weaknesses in each of the characters present on screen, be it cowardice or arrogance, and meets that with the often fatal results of such weakness. The world of Titan is not for the faint of heart or a place for wanton bravado, and these last few episodes, with the advent of another attack and the first real encounters for the newly graduated class, drive that home hard. Titan has had me going ‘no way!’ and ‘what next! ?’ nearly every episode, leaving me hungry for more. That it has managed to at once strengthen and tarnish its characters through backstory and heart wrenching tragedy has kept the story fresh, well-paced, and feeling like a whole, cohesive image – we aren’t dealing with a few special individuals in this world but whole squadrons, whole cities, and the wonderful storytelling manages to capture the essence of this without washing out the individuals. Indeed, it uses events to bring focus back onto the central characters via deaths, injury, and circumstance before sweeping out onto the usually daunting odds our protagonists are forced to endure. It’s a powerful emotional journey that draws me into moments of determination, defeat, rejuvenation, and victory alongside the cast. Centerpiece moments introduce us to Mikasa’s personal breakthrough, to the lengths Eren will go for his friends, and to game-changing experiences with the new titan-vs-titan complication. What is this new Titan? Are none of the protagonists safe? Where do the Titans come from and what is their purpose? These are questions that are rooted in the very core of the story, a core around which Attack on Titan is executing a delightfully suspenseful dance. I have no complaints as of yet. There are several potential pitfalls that will determine my final say about Attack on Titan, but it has managed to avoid these perilous drops while offering very rare, brilliant morsels as promises for the future. 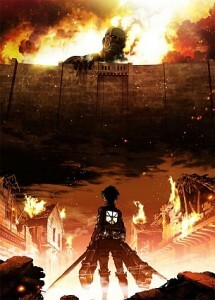 How well the conspiracy threads weave, the question of Eren, and the mystery of the Titans all hold great potential, and I sincerely hope I am not let down.